Can Manchester United overcome the odds to sign Chelsea superstar? Manchester United look to have been given a big opportunity to seal the shock transfer of Eden Hazard as he has his heart set on leaving Chelsea. According to Marca, the Belgium international has refused five times to sign a new contract at Stamford Bridge and will run down his current deal, which expires at the end of next season. Real Madrid look the favourites for Hazard at the moment with most renowned bookies, as you can see with a look through on BettingTop10.com USA, but there may well be a big opportunity for United to nip in for the 27-year-old in the near future. If, as Marca claim, Hazard is dead set on not renewing with Chelsea, the Blues will be forced to accept a reduced bid for him either this January or in the summer, meaning United could sign him for significantly less than his £150million asking price of recent months. They may even be able to snap him up on a free in 2020 if a sale cannot be agreed, meaning it’s anyone’s guess where the player ends up. Chelsea’s Eden Hazard to Manchester United? Don Balon recently claimed Zinedine Zidane was keen on signing Hazard if he became United boss, as is being widely reported that he could. The Frenchman has spoken publicly of his admiration of the former Lille star in the past, while the player has also spoken of the coach as an ‘idol’. Hazard has also been linked as a target for his old manager Mourinho in the past as well, having been a key player for the Portuguese during his time in charge at Chelsea. While things didn’t exactly end brilliantly between the pair, Mourinho has shown a willingness to repair relationships with former players he’s fallen out with. Despite axing Juan Mata during his time as Chelsea manager, the 55-year-old has worked well with the Spanish playmaker when reunited with him at United again in 2016. Mourinho also notably fell out with Nemanja Matic towards the end of his time at Stamford Bridge, when he humiliated the Serbian by subbing him off in a game in which he’d already initially subbed him on from the bench. However, he then ended up signing the 30-year-old for the Red Devils last summer, and he’s been one of his most important players at the Theatre of Dreams. Hazard and Mourinho are both professionals and winners and could surely strike the right kind of balance again at United if such an opportunity came along. Of course, it may be that the lure of a move to Real Madrid ultimately proves too strong for Hazard, though of course the Zidane factor is an important one too. MUFC may well be close to making a change in the dugout after a poor start to this season and Zidane would surely jump at the chance to sign one of his favourite players if he got the job. There’s no question the Blues attacker would be a significant upgrade on the out-of-form Alexis Sanchez, who has been a major flop since his January transfer window switch from Arsenal, as well as for inconsistent youngsters Anthony Martial and Marcus Rashford. Hazard’s flair and swagger on the ball would surely make him popular with the United home crowd, who are used to watching the very finest players in the world. Similarly to the likes of Eric Cantona, Cristiano Ronaldo, Robin van Persie and Zlatan Ibrahimovic, there is a certain arrogance to the way Hazard plays that would surely make him an instant hit with one of England’s most successful clubs. Frankly, whatever the price, United should be prepared to go all out to make this move happen as his contract situation with Chelsea surely presents an opportunity that may not come up again. It’s rare that such good players can move on the cheap from major rivals, and it just so happens that he’s exactly what United need at present anyway. The 20-time title winners have also been linked with the likes of Antoine Griezmann and Paulo Dybala in that area of the pitch, while it’s also known that a move for Real Madrid winger Gareth Bale failed last summer. Before that, Mourinho also tried bringing in Ivan Perisic from Inter Milan, but Hazard is arguably superior to any of those. 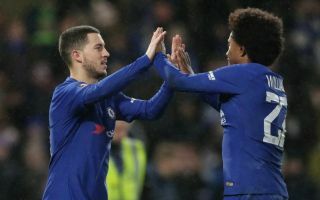 Chelsea fans would no doubt be majorly gutted to see their star player join a rival, with the likes of Mohamed Salah and Kevin De Bruyne also recently leaving CFC to shine for other big sides in England.